I honestly feel this might be Mike Browns most important offseason. He is on the verge of losing close to an entire fan base. I would not be surprised at all to see the majority of our fans jump on the Cleveland bandwagon. They are up and coming and we are spiraling downwards. For as smart as the man thinks he is, I pray Mike Brown makes some changes for once. Not sure I am going to keep mine. I'm going to stall to see what they do before committing. 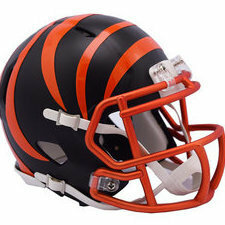 Definitely not giving up on the NFL, but I'll never be a true fan of another team that isn't the Bengals. I'm definitely less engaged than I was 3-4 years ago though. I love the sport too much in general to just not watch, and I have teams that I like because of players or coaches I enjoy watching. I'll pull for the Vikings because of Zimmer. I like watching the Saints because of Brees and all the former Buckeyes on their team. At this point i'm convinced Mike Brown is immortal and is sustained by the tears of the Bengals fan base. There's plenty of room and we'd always welcome our CARP brethren. Also, as a Daytonian, it would really help if you could get these ridiculous Cincinnati overlap games to display Browns games. This regional broadcast garbage is killing me. Do you guys even want to watch your game against the *Quickly Google Searches* Broncos? Wouldn't you all rather watch Baker vs. Watson this week? Come on guys...Mike Brown is an inept and poor man's version of his father. You've suffered long enough. Come join us. After 20 years of garbage, this time the Browns have it figured out! I won’t spend any money on the team but I will be a fan unless they move the team out of the city. I could never root for another team as much as the bengals. I haven’t lived in cincy since I graduated high school in 99 but after thinking about it if I lived there I would prob have season tickets. Pittsburgh loses to NO and NE, putting them at 8-6-1 heading into week 17. Baltimore loses KC and LAC, putting them at 8-7 heading into week 17. Mike Brown extends Marvin for his miraculous upset, calling it the building block for 2019.